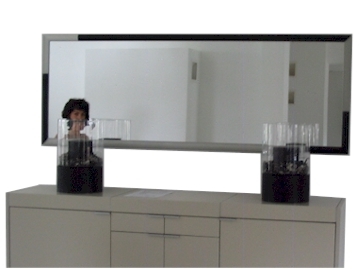 "Moderna" Modern, Timeless and yet Trendy Design Mirrors. The tension, that "cool" metal in combination with "living" wood creates, makes you wonder and look, over and over again. The frame is made of an aluminum profile and can be delivered with wooden parts in beechwood or cherry. The options in framecolor, woodenparts that can be placed and arranged to your preferences, and the availability in different sizes, make each product unique!